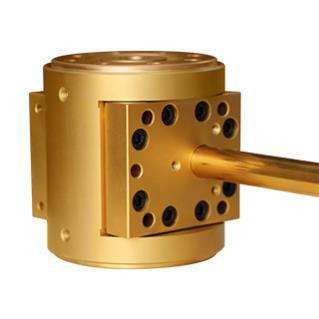 Melt pump for extrusion is mainly used in conjunction with pump extruders. They reduce the natural pulsation and irregular conveyance, added to which, the build up of pressure in the gear pump is more efficient in comparison to the extruder.The melt pump reduces pressure fluctuations caused by the extruder to a minimum. 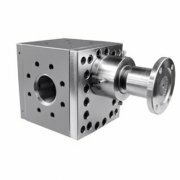 The flow-optimised inlet, outlet and smaller flow channels also lead to an increased flow velocity, reduced residence time and low shear stress. 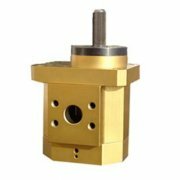 Gear pumps for extrusion are commonly used for the precise transfer and metering of polymers, fuels and chemical additives. 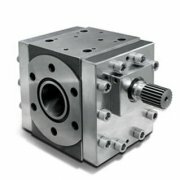 In extrusion applications, gear pumps (melt pumps) stabilize the process by generating a constant pressure, ensuring a constant flow of material and relieving the extruder from the pressure build-up task. Melt pumps and gear pumps optimise the extrusion process of thermoplastics since they ensure a constant flow of material, generate the required operating pressure.We are engaged in manufacturing and supplying excellent quality melt pump extrusion to our valuable clients.